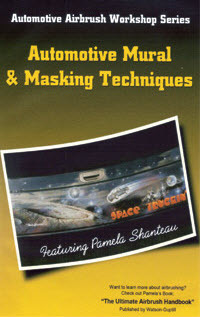 This automotive and motorcycle mural airbrushing DVD titled, 'Automotive Mural and Masking Techniques', is perfect for airbrushers who want to learn more advanced airbrushing techniques. This airbrushing guide explains master airbrusher Pamela Shanteau's masking methods and materials she uses for painting amazing automotive and motorcycle murals. Pamela's freehand techniques for professional looking results! Essential information on creating lay-outs and paint surface preparation before airbrushing! This instructional DVD will give you an insiders look at the advanced techniques of one of greatest airbrushers in the world. A perfect companion to an Introduction To Airbrushing Flames and Motorcycle Gas Tank Airbrushing DVD's. Save $9.90! Order an Automotive Mural and Masking Techniques Introduction To Airbrushing Flames, and Motorcycle Gas Tank Airbrushing DVD's, and you'll get $9.90 off!